Juventus moved four points clear of rivals Napoli at the top of Serie A with a routine win over Atalanta. 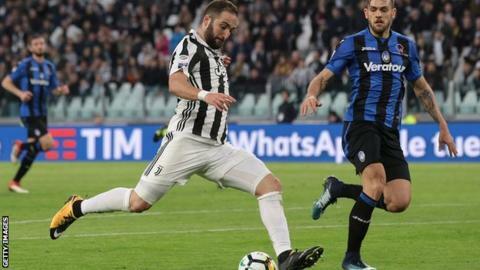 Argentine forward Gonzalo Higuain opened the scoring as Juventus took full advantage of their game in hand. It was a lead they rarely looked like relinquishing, especially after Gianluca Mancini was sent off for two yellow cards in quick succession. France international Blaise Matuidi's late strike wrapped up the Bianconeri's 12th consecutive league victory. Higuain has now scored eight times in 10 appearances against Atalanta, who remain eighth. He was aided significantly by the contribution of Douglas Costa. The Brazilian winger carved through the visitors' defence allowing Higuain to fire beyond Etrit Berisha. Atalanta's hopes of restoring parity disappeared when Mancini was booked for fouls on Higuain and Giorgio Chiellini. It allowed the Serie A leaders to add a further goal and keep a ninth consecutive clean sheet in the league. Match ends, Juventus 2, Atalanta 0. Second Half ends, Juventus 2, Atalanta 0. Hand ball by Andreas Cornelius (Atalanta). Attempt blocked. Paulo Dybala (Juventus) right footed shot from outside the box is blocked. Assisted by Alex Sandro. Foul by Josip Ilicic (Atalanta). Gonzalo Higuaín (Juventus) wins a free kick on the right wing. Medhi Benatia (Juventus) is shown the yellow card. Marten de Roon (Atalanta) is shown the yellow card. Goal! Juventus 2, Atalanta 0. Blaise Matuidi (Juventus) left footed shot from the centre of the box to the bottom left corner. Assisted by Gonzalo Higuaín. Second yellow card to Gianluca Mancini (Atalanta) for a bad foul. Substitution, Juventus. Andrea Barzagli replaces Douglas Costa. Gianluca Mancini (Atalanta) is shown the yellow card for a bad foul. Corner, Atalanta. Conceded by Giorgio Chiellini. Josip Ilicic (Atalanta) wins a free kick in the defensive half. Hand ball by Andrea Petagna (Atalanta). Substitution, Atalanta. Andreas Cornelius replaces Hans Hateboer. Offside, Juventus. Blaise Matuidi tries a through ball, but Gonzalo Higuaín is caught offside. Attempt missed. Miralem Pjanic (Juventus) right footed shot from outside the box is too high. Assisted by Paulo Dybala. Attempt blocked. Paulo Dybala (Juventus) left footed shot from the centre of the box is blocked. Assisted by Kwadwo Asamoah. Gonzalo Higuaín (Juventus) wins a free kick on the left wing. Substitution, Atalanta. Andrea Petagna replaces Robin Gosens. Attempt missed. Douglas Costa (Juventus) right footed shot from the right side of the box is close, but misses to the left. Assisted by Gonzalo Higuaín with a through ball. Hand ball by Josip Ilicic (Atalanta).